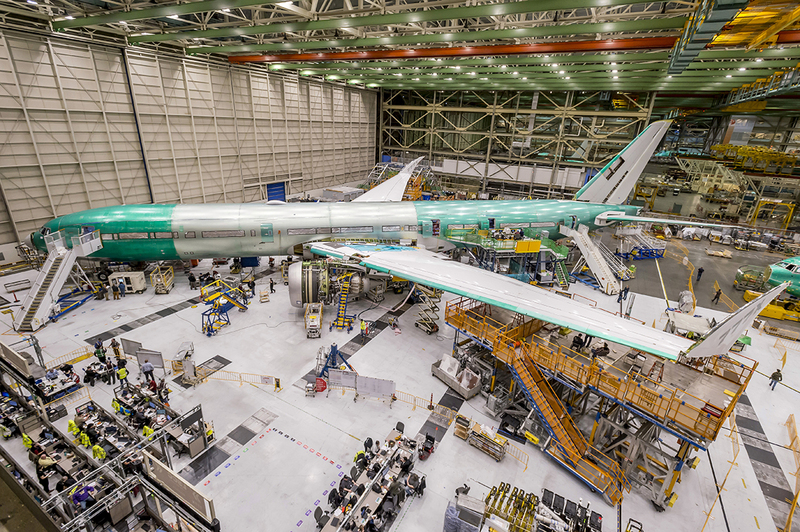 February 07, 2019, © Leeham News: In our analysis series about the 777X, we have now come to the smaller member of the 777X, the 777-8. It’s what’s called a “cut and shut” shrink of the main variant, the 777-9. A cut and shut derivative of a larger base aircraft gives the smaller aircraft some special characteristics. We look at what this entails. Figure 1. First flight test Boeing 777-9 with the GE9X engines mounted. Source: Boeing. The 777-8 is a “cut and shut”variant of the 777-9. This means it keeps the wings, engines, landing gear and empennage of the larger 777-9. A shorter fuselage with a reduced cabin size means the 777-8 filled with passenger and cargo has more weight margins for fuel within the same Maximum Takeoff Weight as the 777-9. The end result is an Ultra Long-haul capable aircraft, available from 2022.